When Rick started thinking about a small tactical pen we wanted to have a pen that is as small as the refill would allow but still have something that you could use to get out of a bad situation if you had too. So as you all can see we kept to the basic idea of all of our pens and kubatons with the deep grooves at each end of the body. 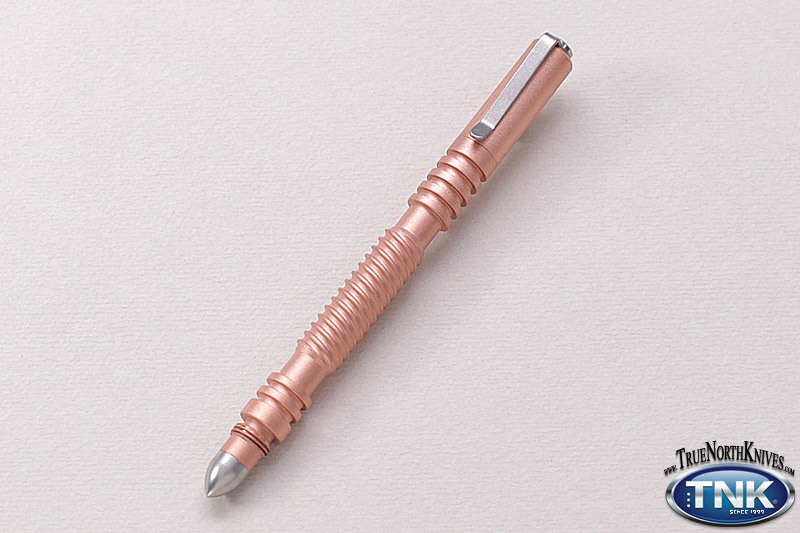 This model like all our others is also a MODULAR pen. The small bullet on the back of the pen is a separate threaded piece, meaning that we will be adding all of the other attachments such as the warhead, strike bezel, etc. Designed and manufactured using state of the art CNC and CAD_CAM technology. Properly placed traction grooves give a good firm grip when using pen in a CQB mode. Course threads used throughout for extra thread height which translates into a very strong tough thread able to take the punishment of hard strikes. Modular design so the user may add a multitude of 17-4 Stainless Steel end attachments to configure the pen however the person or mission dictates.